Farmhouse Lancashire made using a traditional two day curd method. Open textured, buttery, hint of sharpness. 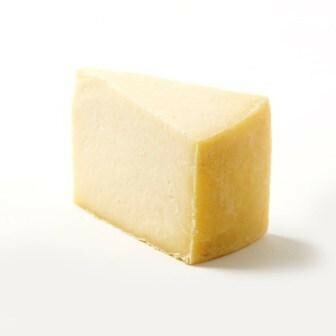 Our Lancashire is made by Graham Kirkham son of the original 'Mrs Kirkham', in the "black land of Fylde" north of Preston in Lancashire where the pasture land is near the Irish sea and the tasty quality of the milk and its cheese is said to be due to the wind driven sea salt which impregnates the pastures. This is where the Kirkham's herd of 100 Freisian cows can be found. Mrs Ruth Kirkham began making Lancashire Cheese at Beesley Farm over 30 years ago. This was a skill she had been taught by her own mother and has now passed onto her son Graham, making him the third generation of cheese maker in her family. In the early days Ruth and husband John started the day with the first milking of their herd and then the milk was pumped straight into a small vat in their little dairy next door. This was then turned into cheese. They had only two presses and would make four 20kg cheeses a day and these were waxed and sold monthly to a wholesaler. After the demise of Mrs Kirkhams's original wholesaler in the mid eighties, she started to supply customers directly and also changed the finished coating of her cheeses from wax to cloth bound and then buttered them. This helped the cheese mature better and to keep the flavour and texture. Unpasteurised milk is used to make this superb example of traditional Lancashire, and the process is unique amongst English cheeses. Cooled evening milk is added to the warm morning milk and rennet is added; the curd is cut by hand with curd knives and then allowed to settle with a view to retaining as much fat as possible. The whey is drained off and the curd is stored for the night. The following morning the previous day's curd is milled and mixed with the day's fresh curd in a proportion of one to two. Keeping the curd overnight encourages the development of the acid which gives the cheese its striking whiteness and sharp edged flavour. Then the cheese are salted, pressed in muslin and allowed to dry out. Lancashire is particularly good for making Welsh Rarebit. Many years of experiment and pleasure suggest that the best recipe calls for four slices of thin buttered and trimmed toast kept warm while four tablespoons of butter are gently melted and half a pound of Lancashire cheese - crumbled between fingers- half a pint of beer, two egg yolks, two tablespoons of mustard, a couple of dashes of Worcestershire sauce and a shake of cayenne and paprika are stirred slowly together until the mixture is completely smooth, poured over the toast and browned under the grill.